How Ultrasonic Sensing Technology Works | Migatron Corp.
Understanding Ultrasonics Ultrasonic Sensing/Control Basics Ultrasonic signals are like audible sound waves, except the frequencies are much higher. Our ultrasonic transducers have piezoelectric crystals which resonate to a desired frequency and convert electric energy into acoustic energy and vice versa. The illustration shows how sound waves, transmitted in the shape of a cone, are reflected from a target back to the transducer. An output signal is produced to perform some kind of indicating or control function. 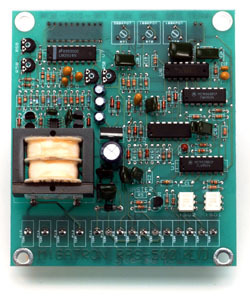 A minimum distance from the sensor is required to provide a time delay so that the “echoes” can be interpreted. Variables which can effect the operation of ultrasonic sensing include: target surface angle, reflective surface roughness or changes in temperature or humidity. The targets can have any kind of reflective form – even round objects. Discrete distances to moving objects can be detected and measured. Less affected by target materials and surfaces, and not affected by color. Solid-state units have virtually unlimited, maintenance free life. Can detect small objects over long operating distances. Resistance to external disturbances such as vibration, infrared radiation, ambient noise, and EMI radiation. An object passing anywhere within the preset range will be detected and generate an output signal. The detect point is independent of target size, material, or degree of reflectivity. Precise distance(s) of an object moving to and from the sensor are measured via time intervals between transmitted and reflected bursts of ultrasonic sound. The example shows a target detected at six inches from sensor and moving to 10 inches. The distance change is continuously calculated and outputted. This term refers to the “tilt response” limitations of a given sensor. Since ultrasonic sound waves reflect off the target object, target angles indicate acceptable amounts of tilt for a given sensor. If an application requires a target angle beyond the capabilities of a single sensor, two sensors can be teamed up to provide an even broader angle of tilt. This term is defined as the area in which a round wand will be sensed if passed through the target area. This is the maximum spreading of the ultrasonic sound as it leaves the transducer. Some standard proximity sensors can be furnished with a “hysteresis control” capability. Many hysteresis sensors have a fixed detect point equal to the sensor’s minimum range, and an adjustable turn off point up to the sensor’s maximum range . Consult factory for hysteresis option. The TBT/TBR-600-40 is primarily a Thru-Beam sensor consisting of one transmit and one receive transducer, in separate and self-contained housings. When connected to any RPS-100/300/325/326 proximity sensor, an RPS-500 ANALOG RANGING CARD measures discrete distances to a target within a selected range, then outputs one or more signals to a controller or computer. F = Change in temperature in Fahrenheit. All units are furnished with mounting capabilities and an LED to indicate output state. Also included is a 6-ft. cable. Optional cable lengths are available.All sensors can be easily interfaced with controllers or computers. Note that proximity sensors (RPS-100/300/325/326) can be quickly converted into ranging sensors via a simple connection to a RPS-500 Analog Ranging Card.